Through seamless technology in the temple,you can now track your activity through the Level app. Wearable technology is taking many industries by storm, and eyewear is no exception. 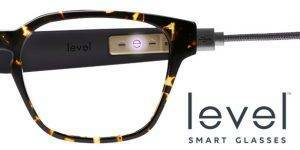 Level smart glasses are the first practical entry into really advanced, smart eyewear. Learn more about how you can #LevelUp at www.leveltechnology.com. This product will be launching soon to our office.